Natural disasters have posed a danger to people and their settlements for centuries. The risk of their occurrence and far-reaching devastating physical, ecological and economic consequences has been a subject of thorough analysis for many researchers over the course of time. Despite their great efforts, the number of casualties caused still reaches tens to hundreds of thousands each year. One of dire natural threats is a high tidal wave called ´tsunami´ in the Japanese language (harbour wave). A tsunami is a series of ocean waves caused by the displacement of a substantial volume of water, most frequently due to underwater earthquakes, volcanic eruptions or landslides, all of these being quite unpredictable. Tsunami waves do not resemble normal undersea currents or sea waves. They have a small amplitude (wave height) offshore and far longer wave length (often hundreds kilometres), which is why they pass unnoticed at sea. They travel at well over 800 kilometre per hour until they reach shallower water, approach the shoreline and grow in height, reaching tens of meters, devastating coastal areas, wreaking havoc, and causing death. Over the course of years, technological development has allowed onshore inhabitants to face the devastating consequences of approaching tsunami waves. By increasing awareness, monitoring and analysing, developing pro-active plans, and applying improved detection methods, authorities are able to take action more effectively nowadays. Numerous procedures and policies supported by high-tech solutions have been implemented with a single goal – to warn the population before the wave reaches land in order to prevent major destruction and loss of life. Man has no power to control Mother Nature yet has substantial resources to challenge its forces. Therefore, siren-based tsunami warning systems have become very popular in regions with a high tsunami risk. Electronic sirens are successfully replacing the older version of motor-driven sirens that were able to generate only tone warning signals. With the current technological development, a greater need arose to provide more accurate and more reliable warning solutions, combining modern risk management processes and cutting-edge technologies. A growing understanding of natural phenomena has led to the development of more innovative warning products that offer the populations living in these areas better chances for survival when a threat occurs. Right from the start, Telegrafia’s philosophy in product development has been based on thinking and acting globally. Inspired by the diverse needs of its customers, the company seeks innovative solutions and manufactures top-quality components to be able to build and offer the most advanced warning systems. Powerful electronic sirens are only one of a few components within the whole tsunami warning system offered by Telegrafia Company. A sensor network capable of detecting an oceanic earthquake. A network of powerful electronic sirens capable of warning the population in the affected areas. An appropriate emergency response of the populations in such areas. The main goal of the project in Malaysia was to get prepared in case disastrous waves smash the coast in the future. A stimulus for such action came from what happened during the tsunami disaster in Aceh, Indonesia, at the end of 2004. A massive tsunami, which was triggered by an earthquake beneath the Indian Ocean with a moment magnitude of 9.1-9.3, hit the southern Asian coast on 26 December, 2004. The earthquake was the third deadliest natural disaster in recorded history. Huge tsunami waves arrived in approximately 30 minutes after the earthquake, some of them as high as 30 meters, and hit the adjacent coastal areas in smashing power. The region that suffered most was Aceh, located on the northern tip of the island of Sumatra. Many victims were taken completely by surprise because there was a shortage of efficient sufficient tsunami warning systems. Nearly all the casualties and economic consequences were claimed to be within this region. Its capital, Banda Aceh, was literally swept away from the surface. 130,000 people died and 30,000 were missing. Many of them lost their possessions, nearly 200,000 houses were destroyed, and half a million people evacuated. The coastal geography of the province changed irreversibly and the disaster left its marks on society. The province rouse from the ashes in the end, but the scars have remained. More steps need to be made to prevent such disasters and their immediate aftermaths in the future. 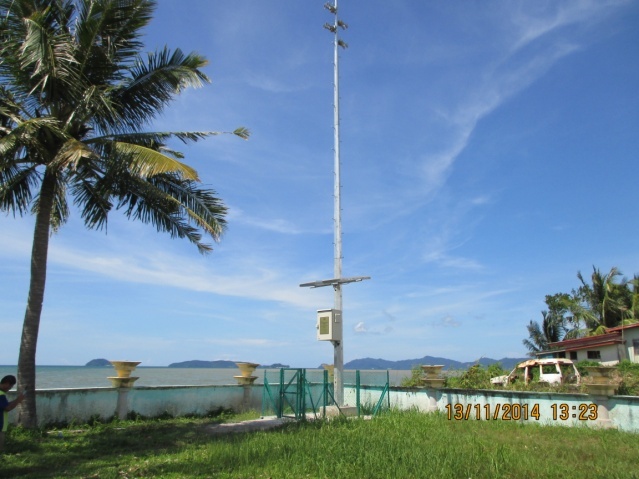 The installation of a tsunami early warning and notification system in the area was successfully completed in 2014. The final recipient of the system was the Malaysian Government Agency. The system was an extension of the already existing warning system, giving warning to the population in the area and relevant emergency agencies. The model designed by Telegrafia emphasised increased mutual cooperation and coordination with leading local suppliers. We feel strong having a vast responsibility for coordinating the smooth and effective deliveries of our technologies abroad, thus we choose to work with the best local providers. The project system was developed and fully implemented by our sole Malaysian representative. The model implemented, which also received official acknowledgment from the Malaysian Government Agency, was a combination of our sophisticated electronic sirens, great service, and a competitive price. Partners´ long-lasting experience in siren installations is a guarantee for efficient local after-sales service support as well. 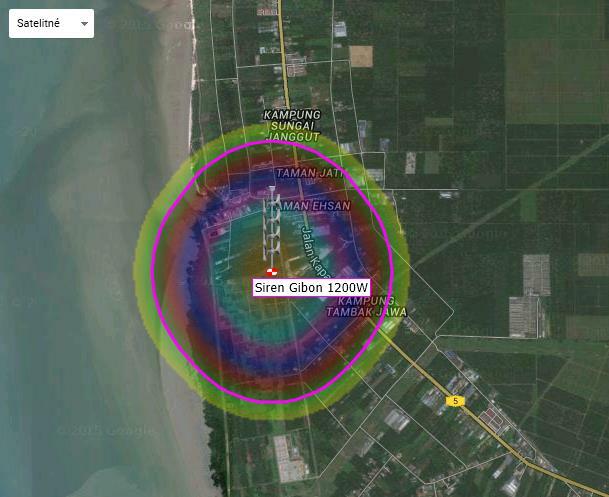 The new extension of the tsunami siren warning and notification system in Malaysia consists of 30 fully-electronic sirens of the 1200W Gibon line. The sirens are placed along the coast to cover the areas most exposed to tsunamis. Each siren, installed on a mast, consists of eight durable aluminium-alloy horns with 150W compression drivers. Its unique and revolutionary design appeared as the first of its kind on the European market, combining the compactness and superior performance of a smaller version of loudspeaker. As a result of corporate research and development activities, there is a warranty that the sound pressure declared is measured in accordance with ISO 13475 (Acoustics – Determination of sound emission quantities for stationary audible warning devices used outdoors – Part 1: Field measurements). The four 300 W (2×150 W) Class D amplifiers are galvanically isolated so as to prevent ground leakage on speakers, which means that failure in one or more of the loudspeakers does not cause failure to the others. The amplifiers are short-circuit resistant and, what is even more important, they are highly economical as they do not consume power in stand-by mode. Each electronic siren serves as an all-in-one complete system equipped with a very reliable, renewable power source – a solar panel. The power solution is perfected by using a lead acid-free battery which enables the whole siren system to be fully self-sustainable and totally resistant to any possible power failure during a tsunami disaster. The designed system offers a maximum level of functionality with a minimum dependence on external stimuli. Managing the flow of information is absolutely critical for the successful operation of a warning and notification system. The principal body in Malaysia responsible for the coordination of all disaster management networks and their interoperation is the National Security Council. Given this hierarchical structure, an alarm can only be activated (for emergency evacuations) after the green light is given by this National Security Council, which first has to seek approval from the Prime Minister. From the very beginning, the Telegrafia Company has regarded an agile product development and customer-driven innovation approach as its main goal. Through the combination of its 25-year-long market and technological expertise, experience in design skills, and competitive product development strategy, the engineers in the company are able to adopt modern technology into the development process. Those steps have resulted in the creation of the unique 3rd generation of modern electronic sirens world-wide – the Gibon siren line. Cost-effectiveness – a complete all-in-one and self-sufficient system designed for high-quality performance and cost-effectiveness – light and durable materials, small horns, and low energy consumption in the siren´s standby mode (less than 10 W). Fast installation & Powerful output – a high level of audibility and maximum sound coverage; lightweight, resilient aluminium-alloy, and easily-installed horns. Modular architecture – the possibility of upgrading the tsunami warning system to a higher version without any unnecessary time-consuming working operations due to a modular product design concept. Modern technology & Reliability – meticulously tested modern design, high dust and water protection, easy access to the siren´s diagnostics information, all of these increasing the convenience of regular maintenance and testing routines. Flexibility – the company’s products perfectly tailored to fit customers’ needs and withstand the harshest weather conditions, the siren´s horns’ acoustic characteristics adjusted to customers’ requests and its digital memory for warning signal and voice message storage (a minimum of 32 two-minute messages) offering multiple warning possibilities. Learn more about state-of-the-art early warning solution against natural phenomena.